Manchester City star Bernardo Silva has admitted that after his team’s recent 2-1 defeat away to Newcastle, he felt Liverpool had the Premier League title more or less sewn up. The Reds ended up dropping points to Leicester City and then to West Ham, allowing City right back into the title race, but Silva thought his side had blown it just a couple of games earlier. 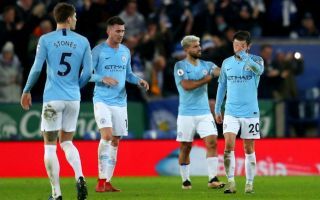 Liverpool can go three points ahead of Pep Guardiola’s men again if they get back to winning ways in the Premier League this weekend, but there’s no doubt they’ve made things harder for themselves by giving City even a glimmer of hope of catching them. The reigning champions strolled to the title in devastating style last season, finishing on 100 points, so are not the kind of team you want to give a second chance to. Worryingly for Liverpool, Silva admits their blip has given him and City renewed hope in this season’s title race. ‘After Newcastle, it was very tough on us. We were very disappointed, more than anyone else. The players, the staff, we were all very sad, because we all thought we had lost the league in that game,’ the Portuguese is quoted in the Daily Mirror. ‘Fortunately, Liverpool drew against Leicester and that gave us a little bit of hope. Then there was another draw against West Ham and that meant the race was on.